Wow. Today was so good. As much as I enjoyed worshipping last Sunday with friends in CA, there's no place like home! Even though it's been like this for some time, I still am so amazed and grateful for our volunteer teams who serve Christ and one another so efficiently and effectively Sunday after Sunday. Having started here with a congregation of about 20 active members and the necessity of wearing many hats it just blows me away to walk into the building on Sunday mornings and see everything being done. All I literally have to do is come prepared to worship and teach. Oh yeah. I also bring the sports section and comics from the Sunday paper for the men's room. The music today was so on target. Some songs just pull out the worship, don't they? Thanks band for all your hard work to make it both excellent and without distraction. Chad L. stepped in today at the bass because Burnie couldn't be here. it was his first time playing on Sunday with us, and he just found out he was needed yesterday. Thanks Chad! Midnight tonight begins our 40 Days of Prayer, which will lead into 40 Days of Purpose. It's exciting to wonder and pray about what God might do in the next 3 months! At 2:55AM my cell phone alarm is going off. Not just tonight, but every night for the next 41 nights. Well, I guess technically it's not nights but mornings. Why? Because I'm part of over a hundred in our fellowship committed to a 15 minute segment of the day to check in with God through prayer and quiet time. 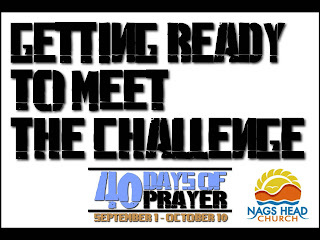 Beginning September 1 Nags Head Church will be praying 24 hours a day through October 10. Why? Because the prayers of those who know Christ make a difference. (My paraphrase of James.) And because we're preparing the the next 40 days to follow as together we discover God's purposes for our lives. Why 2:55 in the morning? First, because my chosen 15 minutes starts at 3AM and I want to have a couple of minutes to get my head together before talking with God. Second, because I've got nothing else distracting my attention at that time of day/night. Third, because I need the discipline in my life. Fourth, because I'm a leader. Fifth, because I know God will be up waiting to hear from me. He never slumbers or sleeps. And I'm starting a day early because I can. Here's a post about things he learned from attending a Jimmy Buffet concert and how the church could better be the church by paying attention to Parrotheads. 1. We drove down and visited the old mission San Juan Capistrano. You know, where the swallows return to every March. Very interesting history. 2. Lunch at Norte (formerly known as Fidel's) in Carlsbad. I met Fidel in February when I was here to officiate at his sister's funeral. Been to the eatery in the past and it is for sure one of the best Mexican restaurants ever. Today Richard's cousin Richard (Fidel's son) was there and spent a few minutes with him. I got the crab burrito. Best of all, the meal was on the house! 3. Waded in the Pacific. The restaurant is just a block from the beach, so we walked down (literally in CA) to the ocean. Amazingly enough I estimated the water temp to be about 70F. That's toasty for the left coast. Too bad we weren't dressed for a swim. 4. Out for "Taco Tuesday" at Fresca's in Anaheim for dollar tacos later this evening. Can you imagine how much chips and salsa I've consumed in the past 6 days? Better yet, don't try to imagine how much frijoles refritos I've put away. It's scary. On the plane early in the AM from LAX. Hope they've gotten the flight plans glitch from today fixed, because we're supposed to connect in ATL. Could be a long day. Humid NC, here we come. Wonder how much Gwyneth has grown since we've been gone? Gail, Richard, Carol and I went to watch the Los Angeles Angels of Anaheim (marketing sell-out at its worst)play the Oakland Athletics (another great name)at Angels Stadium, aka known to locals as "The Big A". I used to attend games frequently here in my high school days. Tickets were cheap and the stadium just 3 miles from our house. When Gail and I lived here during our first year of marital bliss (also our first year of marriage) we would go often or I'd go with friends. Tonight was our first time back since 1978. I discovered that even though their name has changed a couple of times (California Angels to Anaheim Angels to the current non-sense) and their uniform colors went from a predominant navy blue to the current red and their mascot is a monkey showing his teeth, and the stadium has been somewhat renovated, the rules are still the same. The A's won 2-1 because base running skills count. But I predict that barring a total collapse, the Angels will be in the post-season. And the rally monkey will once again cause the rest of the nation to ask, "What is that?". I love baseball. But leave the monkey in the Tarzan movies. Besides, he didn't help tonight. Gail and I worshipped today at the Calvary Baptist Church in Yorba Linda, CA. God is doing some great things with this church and it is so neat to watch it happen from afar. Pastor Brian Moore's teaching today gave me some great fodder for my next series, coming in September called "Radical Generosity". Thanks Brian! Even more exciting was hearing how amazing the worship gatherings were at Nags Head. I'm told someone said, "Don't tell Rick, but this was the best worship service of the year!". That's the best news I could have received today. Knowing that things don't miss a step, but even get better in my absence is fabulous. Nathan and I worked hard (well, Nathan did all the work really) to put today's worship plan together, hoping that it would drive home the point that we're here to reach others. "What on earth are you doing" was the theme today. Included were songs and video of many of the things our church is doing to demonstrate the love of God with the community and world around us. There was also a report and challenge from John Peterson, our missionary with Campus Crusade. Here's a video clip of George's story of a missions trip earlier this year. He gets it! How about you? Great job everyone! Sorry I wasn't there to enjoy it with you. Next Sunday we'll finish our series "40 Days of Prayer" with a look at Jesus' 40 days experience in the wilderness. Then Monday let the 40 Days begin! Says I: "Don't forget to call me." "Let's pray for Rick to move back to California." Says I: "Did you say, 'Let's pay for Rick to move back to California?' How much are we talking about here?." In old town Placentia, CA is a little family run restaurant. If you want the real deal, this is one of the best, but little known Mexican eateries I've found in Orange Co.. Yesterday I got the "Salad Burrito", a burrito filled (I mean filled) with shredded roast beef and refried beans and covered with lettuce, sour cream and guacamole. I've also had their chile relleno burrito - a burrito filled with chiles rellenos. And their chips are home made and thick. Gail and I flew out yesterday to Los Angeles for a week of vacation. We're here because I was asked to officiate at a wedding. But we could sure use the breather. On our agenda is Mexican food. And plenty of it. We also managed a lunch yesterday at Polly's Pies. And I've already opened up a box of See's Candies sugar free peanut brittle. We had dinner with a bunch of friends last night, then crashed. It takes me about 3 days to adjust to the time difference. Now I gotta go out and find a cup of coffee! In the last couple of decades the evangelical church has allowed itself to place a distinction between "worship" and worship. Sound confusing? We are. In many churches the musical part of a service (we call them "gatherings" - "service" here is action not an hour on Sunday) has become the "worship" and the sermon the "preaching" or "teaching". And in most churches the focal point of the gathering is the sermon. Many see the music as optional (especially if their favorite song or style of music isn't being done). I have a hard time with all that. First, I believe my whole life as a Christian is supposed to be involved in worship. "Whether you eat or drink or whatever you do, do all to the glory of God." That's worship. "Love the Lord your God with all your heart, soul, mind, strength". That's worship. So to relegate it to an hour (or like us, an hour and 15 minutes) is not exactly what God had in mind. Sunday we did an experiment. Probably we should experiment more often, because like any church our group or individual, it's easy for us to get into habits and ruts. Here's what we did. Instead of beginning the Gathering with a song or two like we usually do, we began with a greeting and jumped right into the teaching. The singing part of worship came later. Lately we've moved into a rut of having such a good time eating doughnuts and drinking coffee in the lobby that we forget when the Gatherings start. Consequently when the Worship Gathering begins worshipping a lot of people are gulping down and coming in after everything has started - some as much as 15-20 minutes late. Not a few. As many as 25% is my guess. And frankly, for those who have come to worship (which is our purpose) it can be a distraction. "Excuse me, but could you slide down so I can have a seat?" It's tough to focus on God when you're constantly being interrupted by someone coming in late. It was hard on me Sunday. The first ten minutes of my sermon there was a steady stream of late comers coming. Our guys did a great job of finding them seats. But it was a challenge for me to keep my focus on teaching with so much movement. And it was distracting for those who arrived on time. And I'm sure that there were a few people genuinely embarrassed for being a distraction. My guess is that for a number of folks, it's OK to come in late during the music. After all it's kind of entertainment before the real stuff, right? It's the warm up act, isn't it? So wrong. As a pastor I'm concerned we're losing sight of the purpose for our gathering. So Sunday we flip-flopped and put the sermon first, hopefully to bring home a point. Gen. Jackson was known to give orders to shoot stragglers. I don't think we should go that far, however! The Worship Gathering at church is vital to the health of the church as she worships together. It's a time to get real with God and His Word together. It's a time to turn our full attention to God together. And to do anything together means we have to be where? Together. What are we saying to God when we say, "I'll come in and be involved whenever I feel like it?" What are we missing out on when we miss even a word of a song or a prayer? Could it have been potentially life changing for me? We'll experiment some more, and hopefully more often. Maybe it will cause a few to wake up a little earlier and be excited to meet with God and His people together. It was flip flop Sunday today. No, not because of what anyone wore on their feet. Typically we begin each worship gathering with songs. Not today. I got up, gave a welcome greeting and went right into the message. Then we worshipped in song. Like everything we do, there was a purpose for the change. Likely we'll do it this way a few more times in the future, and hopefully the desired result will be achieved. But we do believe in mixing it up from time to time. Today's message was the second in the series and took a look at the story of Elijah and how he came to journey for 40 days and nights to get to the mountain of God. There God reminded him of his purpose and sent him back home to fulfill his calling. Next time we'll go to the story of Jesus' 40 days in the wilderness. Once again there was a bigger crowd (a pretty full house) at 9 and a lesser crowd at 11. In past summers we've never been able to have a consistently larger attendance at one or the other. This year is different for whatever reason. I'm not going to fry my little brain trying to figure it out. But it is interesting. Too many doughnuts! Lots were left over after church, so I made a few stops on the way home making deliveries. But too many are better than too few. Another of the changes we made today was to close up the coffee bar 5 minutes prior to the start of the worship. That's likely to be ongoing. It seemed to help get folks in for the start of the gathering. Frank told me they had 33 kids in Kidmo for the first gathering! Our Jr. Waverider team is the best. And I heard them several times having a great time! I'm looking forward to the re-emergence of our worship choir. If you listen, we have a lot of good voices out there in the congregation! I didn't look after 11:00, but my guess is that the 40 day x 96 prayer schedule was filled today!! Now we're looking for more host homes for Connection Groups and teams to form for prayer on Sunday mornings. And it's always a treat to meet so many new friends each Sunday. "You don't have to let age limit your dreams." Dara Torres, after winning two silver medals in swimming tonight at age 41 at the Olympics. IF you watched the conversation tonight between Pastor Rick Warren of Saddleback Church and Sens. Obama and McCain, how do you think they did? I capitalized the word IF above as a qualifier. If you did not watch, then please refrain from commenting. Also, I don't want this to be "I'm voting for __________ because." Just answer the question, please. If you missed the broadcast on CNN and Fox, I would imagine it will be repeated. Kevin is a pastor up in BC, Canada, one of the most beautiful places I've ever visited. His recent post on losing gracefully is worth a read. For over a month I've been following a blog about a young lady named "Gina" (aka Pepe) who had CF and a double lung transplant and was struggling to stay alive. It was a heart wrenching story. I even posted here and asked you to pray for her. Her story was all a lie. The whole purpose behind it was to raise money to buy a fraud a Wii. A crime has been committed and I'm sure will be investigated. A few days ago I mentioned in a comment that the latest turn in her story was very strange, and it caused me some concern, but still I chose to believe and give her the benefit of the doubt. This is sad because it causes a cloud of doubt to hover over other legitimate blogs and over the entire CF community. I hope this young lady gets some help. You can read the confession of her blogger here. I'm in the process of selling a rental property. Last week a couple gave us a contract on it, which is great news to us. As expected they hired an inspector to look the place over with a fine tooth comb for any issues that need attention. He found a few things - most were minor and easily repaired without having to hire a pro. But one could have been troublesome. Actually it was two - both exterior GFI outlets weren't working. I wondered if the outlets had ever been used. Probably not. And I wondered if somehow they had never been properly wired. Were they even connected to the panel box? There wasn't anything labeled in there saying "exterior GFI". But surely these outlets were working when the condo was built 5 years ago or it shouldn't have passed inspection. Now there's an assumption. I'm no electrician. Electricity scares me. And honestly, I know enough to be dangerous (to myself)! But before I hired one to check it out I'd do the obvious. Hopefully it was something simple. The test/reset buttons weren't working on either outlet. So I pulled one outlet out and saw what could be the problem. Rust. The scourge of the Outer Banks. The screws that connect the wiring to the outlets were rusted on one of the outlets. Five years of salt had rendered the outlets powerless. These are outdoor outlets. And although they have a cover and a seal, our proximity to the ocean (about a half mile away) meant exposure to salt. It's a given here. Salt spray from the ocean and electrical connections aren't a good mix. In fact, it's a major cause of fires along the ocean front. So off I went to Home Depot to pick up a couple new outlets. One of the old ones had noticable rust so I clipped off the ends of the wires and trimmed them back to connect with clean copper. And once I got the new outlets in, guess what? Everything works fine. The problem wasn't the source of the power. The wiring from the panel box to the outlets was even through a GFI circuit breaker. The problem was the corrosion preventing the power from connecting with the outlets. In spiritual terms corrosion is the result of sin in our lives. It doesn't have to be a deliberate separation from God. Usually it's the accumulation of trudging through life. The "salt" finds its way into our lives. And when that happens we lose "contact". David the psalmist wrote that if we regard sin (corrosion) in our hearts we lose contact with God. It blocks our communication with Him. It's not that He's shut off the power. It just can't do its work in our lives because of the sin. And sin separates us from God. Fortunately for us, it's an easy fix. Faith in Christ gives us the privilege of confession to God, and based on Jesus' shed blood on the cross, that confession renews the contact, removing the corrosion. It is an amazing thing. All it costs me is the admission to God that I've been wrong. Of course it's not just saying words, "I'm sorry". God can see through words. He's looking at heart change. Am I ready to throw the old, corroded life away and allow Him to replace it with something new and clean? But the wind keeps blowing the salt. Five years is too long between renewal. For me 5 days is way too long. How about you? This past week a group of leaders from our church attended the Leadership Summit (Willow Creek Community Church) at a satellite venue in VA Beach. As a leader I'm always looking for solid and challenging teaching on how to be better at it. This conference did not let me down. Among those speaking were leaders from the corporate, church and other non-profit sectors. Here are a few of the "bytes" I jotted down. Some were the speakers' own thought; some were quoted by the speakers; some are my thoughts from listening to them. Write down your own leadership axioms. Create a clash of ideas. Get the right people around the table. Leadership that matters to God comes forward when the calling seems hopeless, scary or hard. Jesus didn't come to make us safe - He came to make us brave. Follow your compass not your clock. If you're looking to lead a life of impact then do something to influence children. For a while the leader may have to raise the level of personal investment to sustain the vision. Leaders cultivate the soil so that people can grow. Soil gets messy. You'll get your hands dirty. Fruit happens by staying connected to the Vine. God brings revelation. Revelation brings revolution. In God's eyes being qualified isn't as important as being crucified. A leader/shepherd's job is not to pander to the flock but to lead them. Just show up in the morning; get your orders for the day and execute in obedience. If as a leader I'm not in good shape (physical, emotional, spiritual) I'm hurting the entire organization. If we're going to be good at what we do we must be strategic at what we do. Every leader knows a time when the dream almost died. Callings are holy things; precious commodities. Carry out your calling even if you don't feel the presence of God. Lots to chew on. I look forward to doing some debriefing with our leaders soon. Around our house the Olympics dominate TV viewing. Friday night my wife combined my birthday celebration with the Opening Ceremony and Nathan shaving his head. Big night! For Gail, the rest of the world can just take a back seat. The Olympics are on! Last night I was the only one still up when the US men beat France (so much for the trash talking) in the 4x100 swimming relay. I'm surprised I didn't wake everyone up with my cheering! There are some Olympic events that I love to watch. Some don't interest me at all. What about you? How much of the Games do you view, if any? What impresses you most about the Olympics? Have you been praying for Pepe? "Pepe" - her name is Gina, received a double lung transplant (she has CF) over a month ago when she was very sick and had two strikes against her. The time since the surgery has been very difficult with multiple complications and surgeries. Somehow she has continued to fight. But the latest post on her site indicates her condition must be very grave tonight. Please lift her up to the Father. And don't forget her family and friends who have gone through this very difficult ordeal with her. Today we introduced 40 Days of Prayer with a message from Exodus about Moses' three - count 'em - back to back to back 40 day periods with God. Starting Sept. 1 we're focusing as a church on prayer through Oct. 10. This is in preparation for 40 Days of Purpose to follow. 1. Commit to a specific 15 minutes daily to spend some QT with God. We're looking for 96 people to fill the 24 hours. And we'll do it for 40 days. Non-stop prayer from NHC. If you didn't sign up for your slot today please do so over the next few weeks. The schedule is filling up fast! 2. Host a 40 Days of Prayer small group in your home. We'll be studying prayer and learning about it together. More ways to be actively involved are coming in the next couple of weeks. The MP 13 Band showed remarkable adaptability this morning at the 11:00 Gathering. Rachel got two songs reversed in their order and started singing the wrong song! The band never missed a beat (or a chord since it was in the same key as the correct song) and no one knew. The worship today was excellent. The last song, "From the Inside Out" really connected with the message. One guest family came up to came up and said, "God's doing something special here." That's always encouraging. Sometimes it's hard to see just what is really happening because we're so close to it all the time. I was told that 14 people sat up in the balcony overlooking our lobby during the first gathering. They arrived late (hello!) and with young children in tow. Our pre-school room was again packed to capacity. So they were given the choice of either coming back at 11; sitting with the little ones in the gathering (tough on parents and everyone else around) or sitting up on the balcony (we have sofas and cushy chairs up there) and listening to the service. There's no video and you can't see into the service. They chose the latter! We gotta get the kids wing upstairs finished! I'm going to also encourage our church that if they have a choice, to consider coming at 11 instead of 9. It's always less crowded at 11, and this is the second time in recent weeks we've actually turned people away for lack of space in our pre-school worship. Our amazing volunteer staff continues to serve faithfully to make Sundays the experience they always are at NHC. We couldn't do what we do without them. A big thanks to the 6 or 8 guys who came out yesterday afternoon to set up for worship after Operation Backpack. Most of them are new guys to our church and are excited to find a way to give back. BTW, Operation Backpack provided free school supplies yesterday to 38 local families. Thanks to all who gave and the 40 NHC volunteers who came yesterday to pull it all together. A BIG thanks to Barbara Kay for all her organizational skills in keeping everything sorted and inventoried. Next year's version will be even bigger and better. It's a rainy Sunday afternoon. Looks like prime nap weather to me! Then add to my list of adjectives describing our former senator from NC and one time Democratic golden boy. Leno's having a field day tonight. Got some you'd like to add? Should we expect more from someone who presented himself as possessing the character and integrity to lead our nation? Wanna puke with me? What burns me is that not only did he cheat on his wife - a heroic woman fighting cancer - but that he categorically denied any affair during the campaign. Sounds sadly familiar, doesn't it. Are we really so morally bankrupt? Today, along with other leaders from our church I attended the second day of Willow Creek's Leadership Summit at the Spring Branch Church satellite venue in VA Beach. It's my first time to attend this annual event, and it was so very good. Stuff like this really challenges me. I'll post more about it later after I get some rest! While at the Summit I got a phone call from our realtor telling us an investment property that we had on the market for 8 months got a signed contract today. Whew! Glad that's behind us. This evening when I arrived home Nathan was getting his head shaved due to a challenge to his blog readers. Last Friday he said that if they contributed $3K to Leukemia/Lymphoma research he would shave his head live on the internet. You can see it all on his blog. Lots of fun for a great cause. Following the shaving I got to blow out a candle on my birthday cake. We then played some "Olympic Games". Year 54 has officially begun. How cool is is to have your birthday on 08-08-08? Tomorrow morning our church's first Operation Backpack happens from 9 to noon. We've collected a ton of school supplies which we're giving out to those in need in our community. I love watching our church grasp mission and outreach in practical ways. 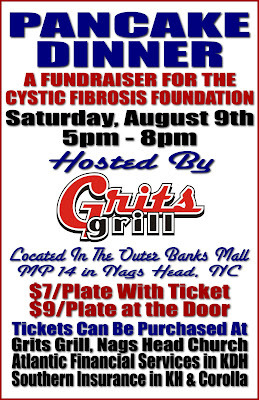 Tomorrow evening is the Pancake Dinner Fund Raiser for the Cystic Fibrosis Foundation. I still have some tickets to sell, and will be serving up pancakes, sausage and eggs. Patrick Pritchard and Grits Grill rock. 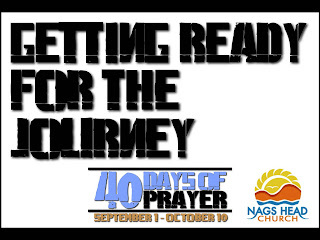 Then Sunday morning I start a new series getting us ready for 40 Days of Prayer, which begins September 1. We're headed for an enormous fall! If you read this earlier post I mentioned how that while preaching Sunday my cell phone distracted me. (I had it on vibrate, btw!) Usually I leave it in my truck on Sunday mornings, but Sunday for whatever reason I chose to have it on my belt. It must have been a God thing because not long after I felt my phone ringing I spoke about distractions that make us think we don't have time to give to others in need. Well, the phone call was for me a distraction while I was talking, so, unplanned, I told the church that my phone had been "ringing", and since everybody who knows me also knows I'm busy on Sunday mornings, it could only mean one of two things. Either it was a wrong number or someone is in need and is asking me to help. I opened the phone and sure enough, the call was from Engine 21 - one of my fire department's engines. (I am a fire department chaplain). Since I couldn't return the call just yet, I waited until the song that followed my teaching. Capt. Elko told me that an 84 year old had been found dead in her bedroom chair by her son, and he was understandably shaken. Could I come? So, after church I drove to the home and spent some time with him, praying for God to bring him comfort. Sunday's talk was about loving those outside of the Christian family with the love of God. And one of my bullet points was that we need to be ready, because we never know when God wants to use us to share that love. When you read the stories of Jesus' encounters with the needy you also get the idea that they were unexpected - at least from the human viewpoint. But He was always ready to say a word or give a touch and meet the need. God used that moment to very vividly illustrate that point to the church. It certainly wasn't in my notes. I'll be there waiting tables! I have to confess. Not too long ago (in the 21st century) I found this in a church literature rack and had to take one. This was there for the taking, presumably by the uninitiated and/or curious. At first I couldn't resist laughing. But it's really not funny. On the back of the brochure is a date. 1971. Now, I remember 1971. I turned 16 in 1971. And I'm sure a lot of men in my church looked like these two. But you gotta wonder what the Sunday School Board of the Southern Baptist Convention (yes, my denomination...) was thinking with this pose and these models. Who were they trying to attract with that? Even more stupifying is trying to figure out why a church 30plus years after this tract was published still has it out for the taking? Is anyone there paying attention? I mean not just to their literature, but to the world that has passed them by? I know the answer, because I know the church. And if you take a look at their dwindling congregation, guess who you'll see? The guy in the picture is still there! Unfortunately his children and grandchildren are nowhere to be found. Here are some comments about and quotes from Darrell Green and Art Monk, who were inducted into the NFL Hall of Fame Saturday. Read the entire article by Washington Post writer Mike Wise here. On the night their championship careers were validated in Canton, Monk's words were as elegant and dignified as Green's were passionate and tearful. They did not come to the birthplace of football as much as they came home, speaking to their extended families. They took the podium and made it their pulpit -- pastors of disparate styles and mannerisms, bringing their people to applause, over and over. At times they led less of a Redskins revival than a religious one, mentioning often their conversion to evangelical Christianity. "As great as this honor is, it doesn't define who I am or reflect the accomplishments in my life," Monk said. "I'll always be known as a Redskin. That's right," he said, as the crowd roared. "One thing I want to make clear is my identity and security is found in the Lord." One of the quotes that caught my attention was, "There is only one Lord and that is Jesus Christ". I believe it was Monk who said that. I'm reminded of Paul's words in Romans 1:16, when this man who had overcome severe hatred toward Christians and the idea that Jesus was Messiah only to become the movement's greatest proponent. He wrote, For I am not ashamed of this Good News about Christ. It is the power of God at work, saving everyone who believes—Jews first and also Gentiles. Tonight at our Communion Fellowship Juan Johnson shared about the three Ethiopian children he and Pam are in the process of adopting. This will the the second set of Ethiopian kids they have adopted, as well as a boy from China. It's what they do, and they asked their faith family to join them in prayer as they work toward making it happen. Here's their blog site. This morning wrapped up the series "What If?" with "What If I Loved the World?". Jesus showed His love for those in His world by doing something. He didn't just say, "I love you", but met them (and us) at our point of need. We should do the same. Be a reflection of Jesus. He served; He gave without asking anything in return. Be real. Forget about trying to look perfect. You're not. Build relationships. Earn the right to be heard. Show that you care. Be relevant. Give a thirsty man a drink of water. He'll want to know why you did. Be ready. You have no idea when the opportunity to show God's love will pop up. Today was Chad Hardison's last Sunday with us for a while. He's off later this week to start law school at Liberty University. I wonder if this die-hard ECU Pirate fan will be able to cheer for the Flames? Chad filled in in a big way for us while Nathan was in Durham earlier this year, and we'll miss his guitar, voice and mostly his service for the Lord in leading our worship. I was told a family left (they arrived ten minutes after the worship gathering began) because there was no more room in the pre-school room for their child. We gotta get that upstairs finished! Hopefully they'll be back (and on time!). The place was really full at 9AM and not far from it at 11. If you were in the second gathering you know that I was called during the sermon to respond in my role as fire chaplain. I'll post about that later, but it was one of those "God things" that happens. Maybe you got to watch the induction ceremony of the National Football League Hall of Fame tonight. I hope you did, but probably you didn't. Two of my favorite past players from my favorite (and hometown) team were among those enshrined in the Hall. Now, if you're not a football fan, please don't give up on me just yet. What was said by these men was little about football and much about faith and character. Darrell Green (#28) was for 20 years a starter at cornerback. Twenty years at the position demanding both speed and the ability to make a hit when it counts. For many of those years Darrell Green was the NFL's fastest man. I'll never forget the Monday Night game against the hated Cowboys when, in his first game, he ran down Tony Dorsett from across the field, preventing a touchdown. I'll never forget listening to a NFL playoff game in 1988(?) against the Bears when he returned a punt for a TD, hurdling over a Chicago player. And he was hurt while he did it. Art Monk (#81) was the most solid, consistent wide receiver who never show-boated; never embarrassed his team; who quietly played the game with dignity, commanding the respect of everyone on the field. How many times did I hear Frank, Sonny or Sam yell out "First down Monk" or "Touchdown Art Monk"? Today's ego-centric gangsters who seem to be the typical NFL player today could learn much from Monk. And after 8 years of not being elected to the Hall, tonight's induction was especially sweet. The standing ovation he received was over 4 minutes long. But if you heard their sons present them to the Hall and then heard their acceptance speeches you heard beautiful testimonies of their faith in Jesus Christ. Gail was listening from another room and commented, "I'm hearing sermons!". Talk about powerful. Here were two black men boldly telling of their Lord, their love for their wives, their roles as fathers to their children and their calling by God to use their gifts for His glory. Talk about role models. I'm sure their speeches will be up on Youtube pretty quick. It's worth watching. Heck, I'm tempted to show them in church instead of preaching myself! In the background was their old coach, Joe Gibbs. I know he had to be busting his buttons with pride, not only because two of his players were joining him in the Hall, but because they represented his Lord Jesus so well. The burgundy and gold never was better than tonight.